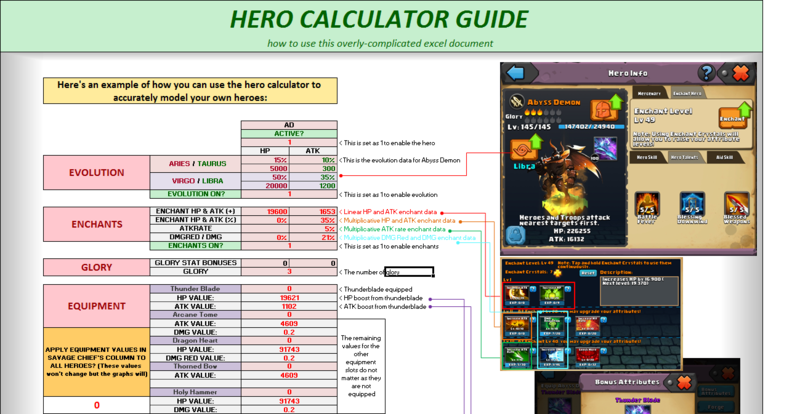 For a while now I've been building a calculator in Microsoft excel that can compare heroes, and work out the HP, ATK and DMG/sec of each hero when different hero aids, talents, equipment, skill, enchantments etc. are applied. 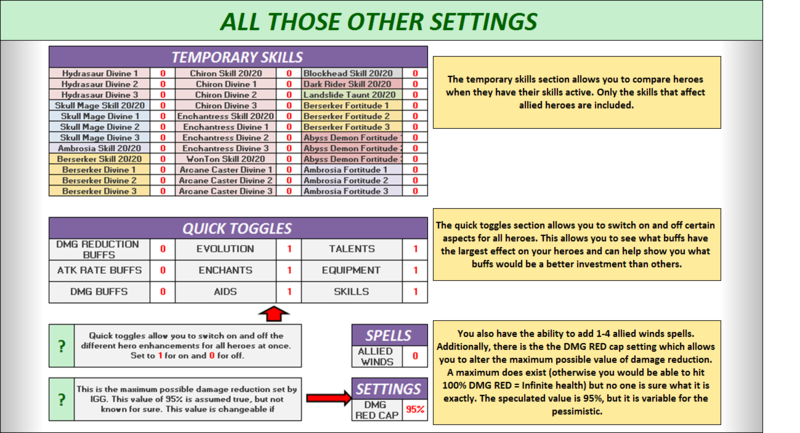 It's a great tool to help people plan ahead and work out what hero formations they might want, what heroes they might want to evolve and what strategies they might use. Initially I started making this for my own use, but quickly realised how useful for everyone else it could be so I've tried to make it as user friendly as possible! The entire calculator is quite large and complex so I wouldn't recommend mobile use. To the extent I've tested it I haven't encountered any problems, but if you do let me know. 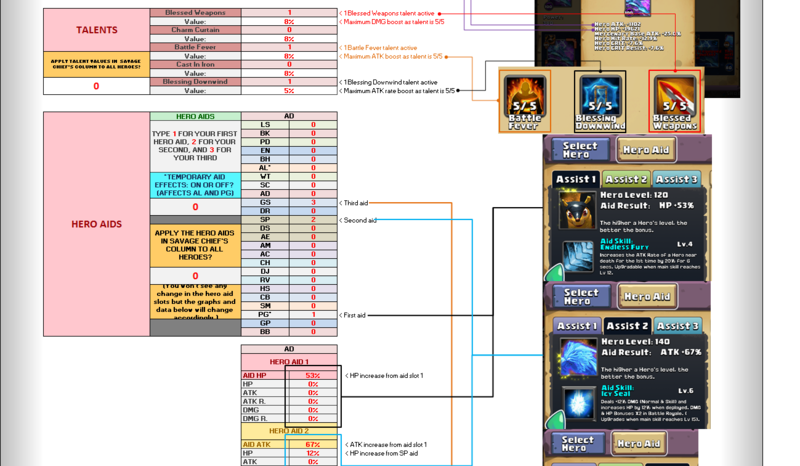 Hopefully this proves to be a useful resource for all clashers! This is seriously awesome. I made some half working thing in excel to compare skill damage but it doesn't even compare. e: looking through it I think the only thing wrong is Chiron's damage, according to IGG support his clones are based off of his base stats. Seems right to me because in game divine 3 Skull Mages look like they do more damage than Chirons, but it's hard to tell since a lot of their damage comes from mercs. Abyss also has some secrets modifiers on his skill, I know it buffs his atk rate and move speed at least. I'll see if live support knows anything. I just tried putting a maxed blockhead aid on him and it definitely doesn't affect his clones. Also tried a chiron aid and his clones weren't the damage reflect either. Also I tried ambros skill after chiron's and the clones weren't getting a buff from that either. Thanks a lot for the testing! I've updated Chiron's data accordingly. Wow what happened to this thread? Had to look through my post history. Anyway from eyeballing it Abyss's skill doesn't boost his damage, but it does add about 40-50% attack speed. 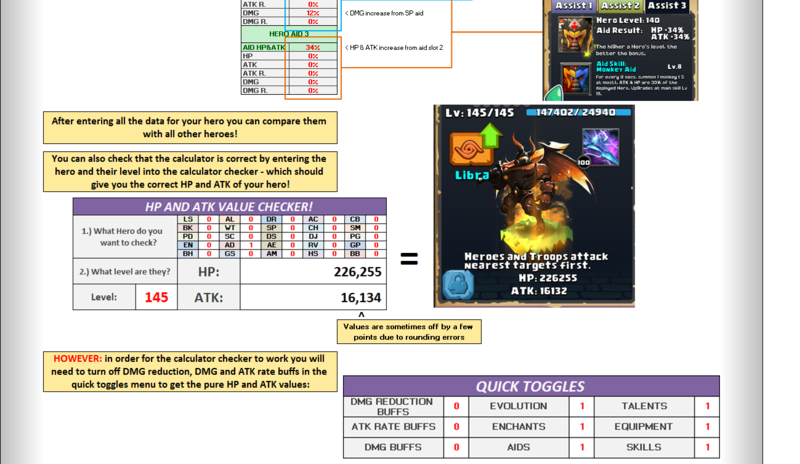 Not accurate enough to add to this or anything, just something to keep in mind, my Abyss usually keeps up with divine 2 Chiron on the damage scoreboard. It seems one of the administrators made my thread a type 2 sticky - removing it from the main message board. Barely anyone sees anything below a type 3 sticky on the front page so it effectively buried my post in the shadows, although I do appreciate it nonetheless. Might as well since you're in a deep layer of sticky hell. Thanks for your efforts on this wheelie. I have had a look at your spreadsheet and have a question. On the Hero Stats Calc sheet you have attack and hp stats for mercenaries, which gives the same values to witches as executioners. Is this correct? I haven't got any solid stat info for witches yet so they're just copied+pasted from executioners so I have some values to play with. I haven't integrated mercenaries into it yet so they don't have any effect on the overall ATK and HP values and are just sitting in the bottom of the spreadsheet waiting to be used when I get around to it! OK. Thanks for confirming, just wanted to check. Definitely buried... especially on mobile devices. This forum is horrible and appreciate your hard work. I was going to code in C for a simple app to configure damage but there is way too many affects I couldn't calculate such as hit rate or dodge or critica % or critical amount etc..